Woody and Buzz are at it again. And this time around, the fun only increases. We see familiar faces, such as the aforementioned Woody and Buzz Lightyear (Space Ranger), and popular toys such as the piggy bank, Mr. 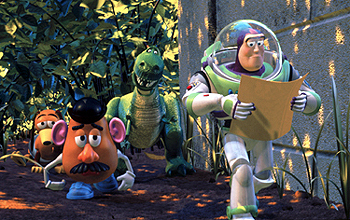 Potato Head, Slinky Dog, and Rex the Dinosaur (see them below). 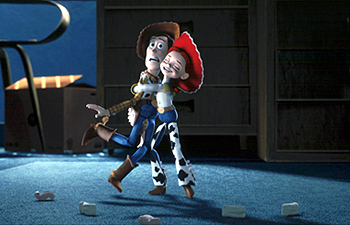 But Toy Story 2 also gives us new characters such as Jessie the cowgirl and a toy store owner named Al. Now where was I? Oh yes! The question on everyone's mind is: "Which one is better?" And to that, my reply is, "Both of them, for different reasons." First of all, as I attempted to explain earlier, the original Toy Story was the trail-blazer. It brought computer animation to the forefront as well as provided us with the wonderful insight that toys are real and alive, and that they come to life as soon as we leave the room. Actually, now that I think of it, the fact that toys are real has been exposed on countless kids shows on TV over the past few generations. But my point is that the first one was great for its fresh ideas. However, the sequel did very well to NOT just repeat its predecessor. It brought a lot of new ideas to the screen, as well as to expand on the humor and amazing animation. For instance, we see the history of Woody and his former heydays. What I loved best was the idea of the toys winding up in a toy store - Al's Toy Barn (which seemed like a great place to shop, by the way). Here there were countless adventures and funny scenes waiting to abound, such as the Buzz Lightyear aisle and the Barbie aisle. 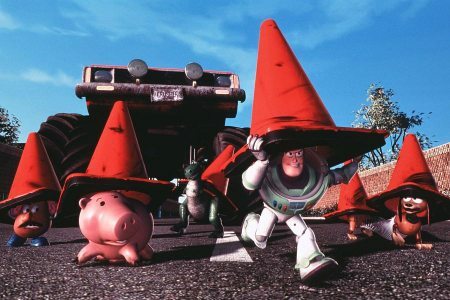 Another one of my favorites was how the toys would cross the street -- using traffic cones (see below). HAHAHAHAHA! 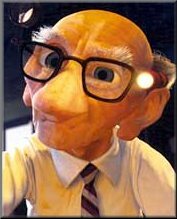 I also liked seeing the old man as The Cleaner. I remember quite well seeing him play chess against himself in a short story before A Bug's Life. It was great to find out more about him here. He also turned in quite a wonderful performance (I wouldn't be surprised to see him at the Golden Globes this year for Best Supporting Actor). And for Best Actor in a leading role, there would have to be Buzz Lightyear, who not only played himself, but also played himself (and himself and himself and himself - in both video games AND in the Buzz Lightyear aisle of Al's Toy Barn). What a superb actor! And for Actress? Hands down it should go to Jessie the Cowgirl! She was great! Not only did she display great moments of joy and exuberance, but she also showed a very sad and dejected side as well. But most of all, she is one of the most lovable toys that I have ever seen. Buzz is quite lucky (they hook up at the movie's end - leaving Woody free to remain with Little Bo Peep). What also gives this movie something extra is the sad Sarah McLachlan song, entitled "When She Loved Me". It appeared somewhere in the middle of the film lamenting the end of a love affair between toy and child as the child eventually grows up. It is quite touching. And Sarah McLachlan is simply a genius at transmitting powerful feelings through her music. My favorite scene: the spoof on Jurassic Park, with Rex trying to catch up to the car. HAHAHAHAHAHA! The animation, the humor, the drama, the suspense, but most of all, the FUN makes this movie a MUST SEE. 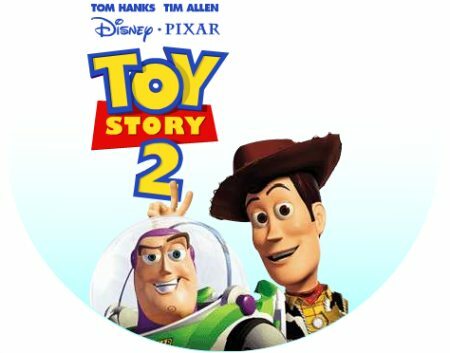 How would you rate the movie Toy Story 2? There have been 32464 people to visit this page since Fri, Nov 26, 1999. And you are the first person to visit this page today!